Place the spare tire, tools, and jack in their original positions. Prepare the vehicle for headlight aim check. Adjust in accordance with headlight tester instructions. 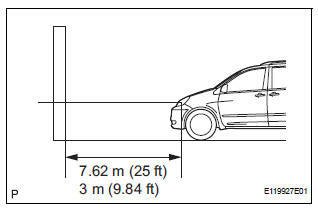 Create a 7.62 m (25 ft) distance between the vehicle (headlight bulb center) and the wall. Prepare a piece of thick white paper (approximately 2 m (6.6 ft) (height) x 4 m (13.1 ft) (width)) to use as a screen. Draw a vertical line down the center of screen (V line). Set the screen as shown in the illustration. Draw base lines (H line, V LH, V RH lines) on the screen as shown in the illustration. 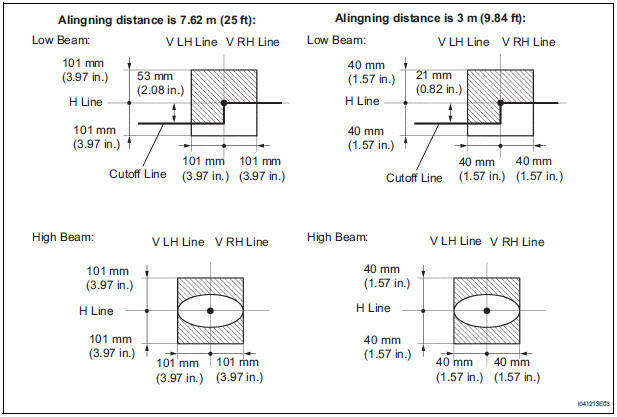 The base lines differ for "low-beam inspection" and "high-beam inspection." H Line (Headlight height): Draw a horizontal line across the screen so that it passes through the center marks. The H line should be at the same height as the headlight bulb center marks of the low-beam headlights. 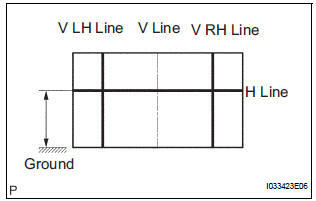 V LH Line, V RH Line (Center mark position of left- hand (LH) and right-hand (RH) headlights): Draw two vertical lines so that they intersect the H line at each center mark (aligned with the center of the low-beam headlight bulbs). 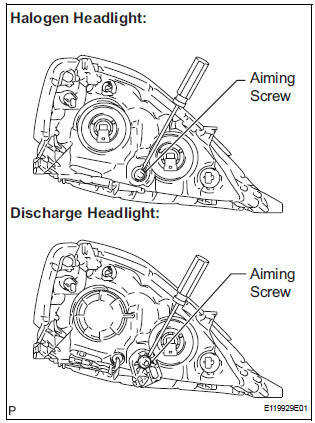 Cover or disconnect the connector of the headlight on the opposite side to prevent light from the headlight not being inspected from affecting headlight aiming inspection. NOTICE: Do not keep the headlight covered for more than 3 minutes. The headlight lens is made of synthetic resin, and may easily melt or be damaged due to heat. HINT: When checking the aim of the high-beam, cover the low-beam or disconnect the connector. Set the headlight leveling switch to 0 (zero). Turn on the headlight and make sure that the cutoff line falls within the specified area, as shown in the illustration. Since the low-beam light and the high-beam light are a unit, if the aim on one is correct, the other should also be correct. However, check both beams just to make sure. Alignment distance is 7.62 m (25 ft): The cutoff line is 101 mm (3.97 in.) above and below the H line as well as left and right of the V line with low-beam (SAE J599). Alignment distance is 3 m (9.84 ft): The cutoff line is 40 mm (1.57 in.) above and below the H line as well as left and right of the V line with low-beam (SAE J599). Alignment distance is 7.62 m (25 ft): The cutoff line is 101 mm (3.97 in.) 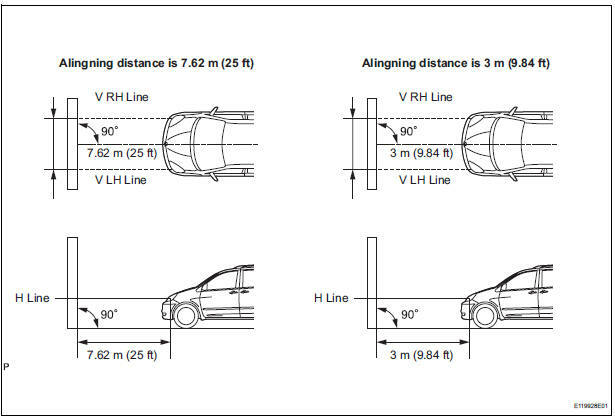 above and below the H line as well as left and right of the V line with high-beam (SAE J599). Alignment distance is 3 m (9.84 ft): The cutoff line is 40 mm (1.57 in.) above and below the H line as well as left and right of the V line with high-beam (SAE J599). Alignment distance is 7.62 m (25 ft): The cutoff line is 53 mm (2.08 in.) below the H line with low-beam. Alignment distance is 3 m (9.84 ft): The cutoff line is 21 mm (0.82 in.) below the H line with low-beam. Adjust the aim vertically: Adjust the headlight aim into the specified range by turning aiming screw A with a screwdriver. The headlight aim moves up when turning the aiming screw clockwise, and moves down when turning the aiming screw counterclockwise.